The rattle issue was snubbed I believe to oblivion. It was not an issue according to my interpretation. Let me tell you, I looked at the FlipBak and Extant folding covers and I believe I made the right choice. The RollBak models I saw had a vinyl cover. As long as I can buy a metal version I'm in. The method of fastening of the other fold backs apparently have problems staying in position. They feel weightier by comparison after inspection and manipulation. The rollbacks eat up valuable space and would require much more effort to get it out of the way when you really need the bed for something significant. The Peragon folds up the neatest I've seen and removes within 30 seconds. Frankly, it's a no-brainer to me. But, one of the important facets of a good sell is when both parties are happy, buyer and seller. I put in for two. I'll give a review after a month and after a period of time. I'm a scrupulous buyer and research the heck out of everything along with driving people crazy. They hate me, but I walk away loaded as an informed buyer. I deserve what I get, good or bad. Heath, I'll be applying for an online job here next week. Does this lock on one side or both? Seems it would be easy to break into with a single lock. I'd say "you're hired! ", but then you wouldn't be the objective voice of reason any more. Couldn't have said it better myself, thank you. Good question. We do lock both the driver and passenger sides of the cover with a 3/8" heat treated steel deadbolt. The one lock on the driver side actuates both deadbolts. 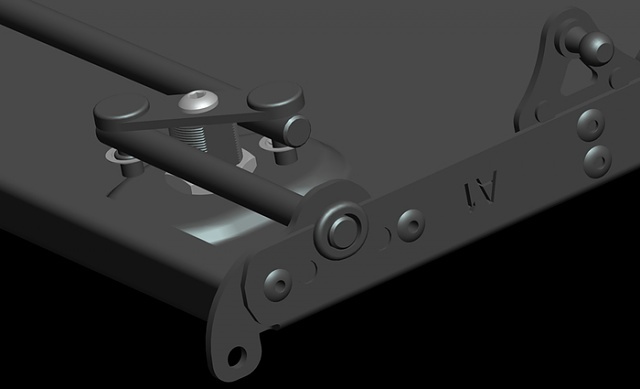 I've attached a CAD image showing the lock assembly. For the record, those steel deadbolts have rubber o-rings on each side where they mount to the lock and they pass through a rubber grommet in the panel - so no rattles. Your website says cover can be left unlocked. How does it stay closed? Last edited by fordtruckman2003; 08-22-2011 at 08:27 PM. True. But I have my hands full anyway. I'm actually trying to find a teaching assistant position in the engineering or math department while I work on my masters. I'll be working hard on convincing students they need to know this stuff we call Math. There are two gas struts tucked under our guide rails right behind the cab. They "over center" and support the first two panels behind the cab so you don't have to use the key lock unless you want to secure the bed. It's convenient because you pull the cover closed and don't need to do anything else to latch it - no *****, levers, etc. To open the cover then, you push down on the first two panels behind the cab. As soon as the gas struts "over center" the other direction, the cover begins sliding forward and continues folding on its own. The overview video on our web site or YouTube gives a good perspective. Also, in the Features section of our new site, under the Retractable feature, there is an interactive demo that allows you to operate the cover in slow motion by clicking and dragging your mouse. Thanks Jack. I actually did now take the time to go back and read that VEEERY long thread about these, where I saw the noise issue addressed a couple of times. This product interests me. It appears to fit my needs pretty well. And I'm impressed with Heath's support for his product, as well as his candid comments about his product. Well, I'm so certain that I want these one way or the other that I had Heath process the purchase, since I have concluded this is my best option. Now, I wonder if I can play ping pong on it. Heath, have any nets to span across it? Do we know where we are (how many) on the group buy? I would love to see enough to earn the bigger discounted price.